Johnson & Johnson has given Janssen Pharmaceutica the green light for an impressive investment project of EUR 42.8 million on the campus in Beerse: Project LION. It stands for Labs-In-One-Network and comprises the construction of a new lab for the Small Molecule Analytical Development & Pharmaceutical Sciences departments. These departments carry out quality tests on new medication, test the release of active components, study the stability of medication and develop the best methods of administration. In addition this organisation is crucial to the support of the Janssen Supply Chain (JSC) and a focus point of the Global Public Health organisation. The fact we are able to invest such a large amount here in Beerse also shows the strength of, and the belief in, our campus. The new building brings together approximately 250 scientists, laboratory technicians, management and support staff, who are currently still spread across four laboratories over the whole campus. From 2020, they will work together in a centralised location on important development activities for new and existing medication in this ‘state-of-the-art’ laboratory environment. 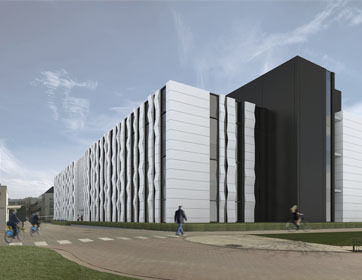 The new building will be constructed on the site of the former chemical factory on the Beerse I campus in Belgium. The preparations for the LION project started in December 2016 and the new building, with a total gross floor area of approximately 10,400m2, should be fully operational in 2020.